According to Edition 863 of Rail Magazine, LNER are thinking of doing a demonstration run on this route to show off their new trains. But is it such a daft idea? In Rail Sleeper Plan Between Caithness And Edinburgh, I talked about a plan to operate a sleeper service on the route between Edinburgh and Thurso, which currently takes nine hours. This journey time is definitely territory for those rail enthusiasts, who ride across America, Australia, Europe and Russia, but it is not for me. But doing the route in day-long segments with a stop in a good hotel, in say Edinburgh and Inverness could open up an iconic tourism route to the Orkney Islands for an increasing number of intrepid travellers, many of whom, like me are past retirement age. 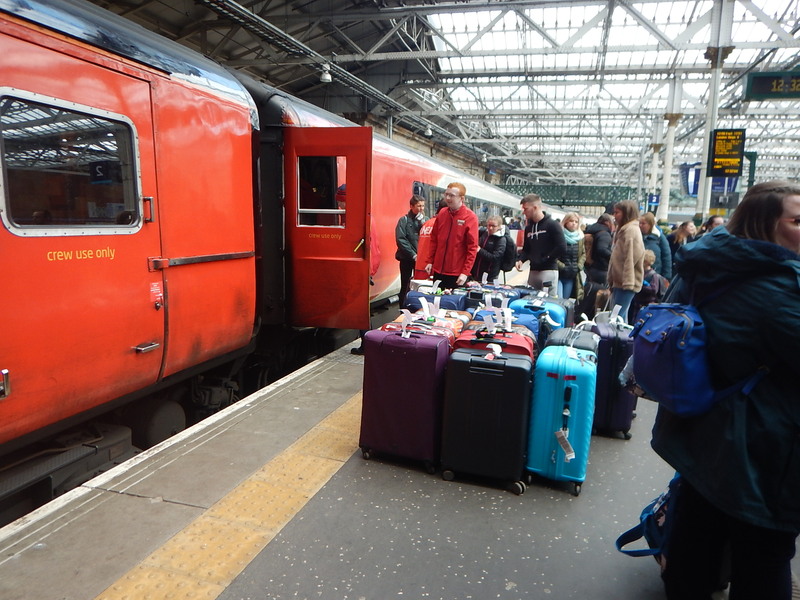 Travel on the Caledonian Sleeper to Inverness and you meet lots of foreign tourists from all over the globe. On all days except Saturday, there are two services between Inverness and London; a day train to and from Kings Cross and a sleeper to and from Euston. To go North on Day 1, you take eight hours on a direct train to Inverness, with after an overnight rest, you take four hours to Thurso. So if nothing else it is route proving for Class 800 trains on the service between Kings Cross and Inverness, which because it serves so many places on the Highland Main Line, is an important route to the area. From the current schedule, it looks like the train will take twelve hours, so there will surely be a lot of driver training possibilities. It surely, will be a good marketing exercise. This archived document was produced by Transport Scotland. Upgrading the Highland Main Line is one of the Scottish Government’s key priorities. The long-term goal of the project seeks to achieve a fastest journey time of 2 hours 45 minutes between Inverness and the Central Belt with an average journey time of 3 hours and an hourly service by 2025. A time of three hours between Edinburgh and Inverness could be possible with electrification to Perth. The Far North Line between Inverness and Thurso doesn’t appear to be built for speed, as it takes a train about four hours to do the journey. It is 167 miles from Inverness to Thurso. It is mainly single-track with passing places. There are twelve services on the line most days, with fewer on Sundays. In the Wikipedia entry for the Far North Line, there is a section called Future Expansion, where this is said. For many years there have been proposals to bypass the Lairg loop[note with a line across the Dornoch Firth, linking Tain (via Dornoch, more directly with Golspie. British Rail attempted to get funding for this when the road bridge was built, but the government declined. Now this project would involve building a new bridge over the Firth, or making dual-purpose the bridge which now carries just the A9. Discussions have been held concerning the shortening of the Far North Line involving a bridge over the Dornoch Firth and the possible use of the trackbed of the former light railway. Nothing has yet come of these ideas. If an hour could be knocked off the journey time, I suspect it would be very beneficial, to both the local population and visitors. What Time Could Be Achieved? I wouldn’t be surprised to see the time between London and Inverness reduced by the Class 800 trains in a couple of years, as the new trains will be able to use electricity South of Stirling and possibly Perth. With the improvements to the Highland Main Line and better signalling on the East Coast Main Line, I could see a time between London and Inverness of under seven hours. This would enable a civilised departure from London at say eight in the morning and still be in your castle, hotel or holiday cottage in time for dinner and a wee dram or several. If improvements were made to the Far North Line, it might be possible to go from London to Thurso in ten hours. Could The Class 800 Train Continue To Thurso? A Class 800 train could continue to Thurso and LNER’s test run will probably prove whether it can or not! It could arrive in Thurso, in time for the evening ferry to the Orkneys. I think though, that the London service would not be extended to Thurso. The train would have to be fully-replenished at Thurso for the trip South. A nine-car train needed between London and Inverness would be too much capacity for the Inverness to Thurso section. The current Inverness to London service starts at eight in the morning and passengers wouldn’t be happy to leave Thurso at three to go straight through to London. But I can see the reduced journey time between London and Inverness attracting more passengers to the route. This article on Rail Magazine is entitled ScotRail HSTs Enter Traffic On October 15. Branded Inter7City as they will serve Scotland’s seven cities, the refurbished HST will run initially between Aberdeen and Edinburgh. More routes will follow as more sets arrive from refurbishment. It also says that the refurbished HSTs will offer. I would also expect wi-fi, comfortable seats, tables and big windows. With their four or five Mark 3 coaches and two Class 43 power cars each with a diesel engine of around 2,200 bhp, these trains must have superb acceleration. By comparison, the the original 2+8 sets of the InterCity 125s have a power to weight ratio of 7.3 kW/tonne. I will also add some other power to weight ratios. New Routemaster bus weighing twenty tonnes with 137 kW – 6.85 kW/tonne. Hummer H2 weighing 2.9 tonnes with 293 kW – 101 kW/tonne. Incidentally, my Lotus Elan weighed about 1050 Kg when I was driving and had power of 121 kW. This gives a power to weight ration of 115 kW/tonne. In Edinburgh to Inverness in the Cab of an HST, I described a memorable ride. One thing I noticed, was that the driver controlled the two engines with considerable precision, to make sure, the train was on time on what must be a challenging route, as it climbed, descended and twisted through the Highlands. With the same amount of power in a train only half the length and weight, I suspect these trains could save time effortlessly, as a good driver in a sports car can on a twisting road. Also, don’t underestimate the contribution, the replacement of the 1970s-style slam-doors with modern powered units, will contribute at every stop. I looked at the actual times yesterday of the 12:00 between Kings Cross and Inverness and compared to my journey in the cab, there are less stops. So services are being speeded up and I suspect ScotRail’s trains stop more often. Transport Scotland talked about a fastest time of two hour forty-five minutes between the Central Belt and Inverness. When the route between Inverness and Perth has been fully modernised with passing loops, I have a feeling that times will be faster. They will not only be an iconic forty-year-old train, but a tourist attraction in their own right, like Scottish mountains, tartan food and whisky. If LNER have an objective in testing London to Thurso with a Class 800 train,, it must be finding a civilised way, to be able to get between London and the Orkneys, by train and ship in both directions within a single day. The first train from Kings Cross to Edinburgh leaves just after 06:00. There has been an aim to run services between the two capitals in under four hours for as long as I can remember. Modern in-cab signalling is being rolled out on the East Coast Main Line to enable 140 mph running. With the improvements to the Highland Main Line and electrification to Perth, three hours between Edinburgh and Inverness should be possible in a Class 800 train or a well-driven shortened HST. This would give LNER options to get to Inverness at a reasonable hour of the day. This could be timed to leave London at 06:00 and it could be in Inverness at 13:00. This would give a fast train on the Far North Line six hours, including transfer to move passengers between Inverness and Scrabster. It looks that ScotRail have the train for the job, in the shape of the shortened HST. They could also serve an early Scottish dinner, to prepare tourists, for what could be a breezy crossing. LNER’s Class 800 trains come in two sizes; five-cars and nine-cars. Two five-cars can run as a ten-car train, that can split and join as required, in under two minutes in a suitable station. So could we see a pair of five-car Class 800 trains leave Kings Cross and run together to Edinburgh, where one train went to Dundee, Montrose, Stonehaven and Aberdeen and the other went to Stirling, Perth and Inverness. The first train from Kings Cross to Aberdeen leaves at 07:00 in the morning. The journey takes six hours. There are three trains per day between London and Aberdeen. The last direct train that is not a sleeper service leaves just before 15:00. As with the route to Inverness, the route to Aberdeen is not electrified. There would be an early morning service to Edinburgh and many of the large towns and cities in Eastern Scotland. The service only uses one path on the East Coast Main Line between London and Edinburgh. If traffic patterns and passenger numbers are favourable, other Aberdeen services could split and join. Running a five-car train to Inverness earlier in the day, before the main train of the day, may be a way to provide an economic service to Thurso. A five-car train would probably be more affordable to run. The train would be stabled at Thurso overnight. It would leave for Inverness, Edinburgh and london about 10:00. At Edinburgh, it could join up with an Aberdeen train at around 16:00. Time-tabled properly, it could result in Inverness and Aberdeen getting an extra train to and from London every day. Plans by various rail companies for services include. LNER will continue to run two trains per hour (tph) between Edinburgh and England. LNER would like to run services between London and Edinburgh in under four hours. TransPennine Express will run more services to Edinburgh. ScotRail will run hourly services between the seven major cities in Scotland. Edinburgh to Inverness and Inverness to Thurso should both to become three hour journeys. Edinburgh will become a very well-connected city. If Edinburgh to Thurso could be achieved in six hours, then any service leaving Edinburgh after about 14:00 would catch the last ferry at Scrabster for the Orkneys. When trains between London and Edinburgh, are regularly achieving the four-hour journey, there will be several trains, that will give a change in Edinburgh suitable for passengers individual preferences. A single change at Edinburgh could be the preferable route for many. Because LNER, ScotRail and other train companies now have a large fleet of very capable trains on order, there are several possibilities to create a world-class train service to connect Scotland fully both internally on the mainland and to important destinations in the islands and England. The renaissance of the HST as a train to provide high-quality services has been astounding. ScotRail are creating twenty-six shortened HSTs for use within Scotland. GWR are creating eleven similar trains for use between Penzance and Cardiff. I would be very surprised, if more HSTs are not refurbished to modern standards. Germany may have the Volkwagen Beetle, but we have the High Speed Train. Could we see them on the following routes? There’s probably enough power-cars and coaches to make another fifty shortened HSTs, so if ScotRail’s trains are a success, I suspect we’ll see some imitation. I suspect too, that just as engineers have found solutions to the problems in the coaches like the doors and the toilets, they will find a solution, that replaces the diesel engine in each power with some form of more eco-friendly hybrid power pack. MTU, which is a subsidiary of Rolls-Royce, are developing hybrid power packs for diesel multiple units. There is a lot of space in the engine compartment of the power car. On most routes, 90-100 mph running will be sufficient. Hitachi converted a power-car to work in this way ten years ago.